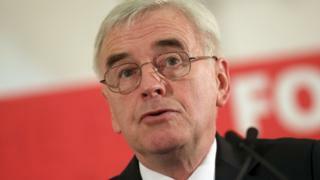 Labour would extend workers' rights and "restore the balance of power in the workplace", shadow chancellor John McDonnell is to pledge.He will promise more rights for people working in the so-called gig economy.In his speech to the Trades Union Congress in Manchester, Mr McDonnell will say a "new workplace environment" will boost productivity.The Tories said unemployment is at an all-time low with millions of low-paid workers given a pay rise. BBC political correspondent Iain Watson said that after a summer of difficult headlines, Labour was looking to set a more positive agenda at the TUC conference. Mr McDonnell is expected to say workers in insecure employment could be given similar rights to those in permanent work, including eligibility for sick pay. "Labour's programme of workplace reform will restore the balance between employer and worker with a significant extension of trade union rights, modernising corporate governance structures and extending the opportunity for employees to share collectively in the benefits of ownership of their company," he will say. "Labour's common sense approach will forge a new workplace environment best suited to meeting the challenges of Britain's ongoing low productivity and the emerging fourth industrial revolution." He will say zero-hours contracts and the gig economy - which is characterised by short-term contracts and flexible hours - have produced "a workplace environment of insecurity not seen since the 1930s", and he will accuse the Tories of "cumulative legislative assaults on trade union freedoms". "The decline of collective bargaining has meant that workers also now have little say over the key decisions taken by their employers over the future of their companies," he will say.Chancellor Philip Hammond hit back, saying: "This is Labour's record on workers - the last Labour government left over half a million more people out of work, and every Labour government leaving office with unemployment higher than when it started."